We’d love your help. Let us know what’s wrong with this preview of Grievous by H.S. Cross. St. Stephen’s Academy, Yorkshire, 1931. A world unto itself, populated by boys reveling in life’s first big mistakes and men still learning how to live with the consequences of their own. They live a cloister H. S. Cross returns to “a school as nuanced and secretive as J. K. Rowling’s Hogwarts” (The Rumpus) in Age of Grace, the sequel to her coming-of-age novel Wilberforce. To ask other readers questions about Grievous, please sign up. Was the title changed? The book is called Grievous, but the summary refers to Age of Grace. A DRC was provided by Edelweiss in exchange for a fair and honest review. 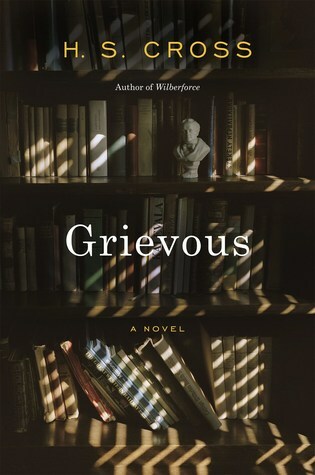 Among the small but game group of readers that managed to make their way through H.C. Cross’s first novel, Wilberforce, there has been growing anticipation and dread at the upcoming appearance of the next book, Grievous. I managed to mentally bushwack my way through Cross’s first tome’s worth of plummy prose, myriad males of all ages, byzantine plotting and absolute immersion in the sealed, claustrophobic public school worl A DRC was provided by Edelweiss in exchange for a fair and honest review. Among the small but game group of readers that managed to make their way through H.C. Cross’s first novel, Wilberforce, there has been growing anticipation and dread at the upcoming appearance of the next book, Grievous. I managed to mentally bushwack my way through Cross’s first tome’s worth of plummy prose, myriad males of all ages, byzantine plotting and absolute immersion in the sealed, claustrophobic public school world of St. Stephen’s in 1920s Yorkshire. When I came to the end I was drained and not even sure if it had been worth it, only that I had been compelled to finish the book despite the struggle and my pesky awareness that there were no female characters other than dead mothers and Matron. Cross has a cult-like following who loved Wilberforce, book, boy, and bildungsroman, but I found myself looking forward to meeting up again with John Grieves, the depressed, charismatic schoolmaster who vanished from the scene two thirds through the first book. Now he’s back and as he was by far the most interesting character in Wilberforce (sorry, Morgan) this helped me to plunge back into St. Stephen’s cloistered world, set a few years later after Wilberforce has gone up to Oxford. Mind you, reacquainting myself with the tropes of St. Stephen’s life - chamber pots, chapel, class, staggering amounts of school work, larks, Fag rebellions, hijinks, boiled sweets, canings, rebellions, more canings, jokes, feasts, verbal jousts, with only the occasional intrusion of outside life and parents, dead or otherwise. Most jarring were the every day, staggering acts of cruelty justified by tradition, revenge or repressed homosexual longings (and that’s just among the masters, to start with) that gave me a deja vu drag that I will always associate with Cross’s willingness to torture her readers while she enlightens/suffocates us. I happen to enjoy a good game of Spot the Allusion, or at least an effort to research the hell out of puzzles such as identifying cat’s head and Lenten grass (edible but yucky Easter treat), the intricacies of cricket and rugby (both of which my father played, neither which he ever bothered to explain) or the fun of translating random Latin phrases, but this may drive other readers barking mad. Immersion in another time requires some authentic historical detail but Cross takes it to a dementedly faithful level where I found myself looking up soaps, soup and long ago walking tours. Her writing may make one sort of reader long for an editor who can prune Cross's prose through the bog of character musings and chatte. That style may make another want to wallow in every meandering plotline and casual exchange between minor characters (Moss, Pearce, Halton, Trevor...who? Spaulding, Silk, Alex, Rees from Wilberforce, I hardly knew ye) There are internal monologues that go on for pages without the thinker ever really making it clear exactly what they are thinking about, but somehow being interesting despite the tendency to whine. Buck up boy! Cross is cheerfully and legitimately beholden to such predecessors as Kipling (Stalky & Co are the students’ acknowledged real saints of St. Stephen’s), Donna Tartt and Evelyn Waugh. I do think the publisher is pushing it with publicity likening her style to everyone from Nabokov to Ivy Compton-Burnett (chortling in their graves) but most of all, to J.K. Rowling, presumably out of a desperate hope that a similar setting of boarding schools might bring similar sales. Will gullible Americans entranced by magical (of a sort) English settings accept the same lack of editing enjoyed by presumably both Rowling and Cross and buy the latter as they did the former? Doubtful, old chap. I don’t yet see a comparison to anything by Ford Madox Ford - the ambiguous, puzzling, tortured and fascinating heroes, the obsession with high Anglicanism, the utter lack of humour, the obsession with sin, suffering, penance, and redemption for every act from stealing a magazine to sexual misadventures to losing faith in boy, man and God. Plot - what plot? Check. Lots of sexual frustration and emotional constipation - check. Inability to actually talk to a woman - check. Latin, check. Terrible personal losses, check. The dangerous nostalgia boys feel for themselves and their rituals even before women, jobs, politics and sometimes war blast them apart - check. Hundreds of pages where nothing happens, then something catastrophic does - check. We do have a new boy in Grievous, brilliant and tortured in Wilberforcian ways, though not as good at cricket. Gray, a budding writer in the Tolkien/Lewis vein, who considers himself “failed material for a character” but can’t help but be interesting, with “a mind full of capacious disorder.” There is also a welcome intrusion of female characters who are not pub girls or Matron, but they are either Gray’s mother, love interest, or love interest’s mother - or they’re related to Grieves, who whinges a bit more in this book but begins to sort it out with Gray by the book’s end. Servants, alas, are as absent as house elves at Hogwart’s, and this is not a group of English men who worry about the effects of colonialism or its expectations on generations of young middle-class men. Why should they, when they are grooming themselves to be Rulers of the World? My review of this book will appear in Historical Novels Review 88 (May 2019). H. S. Cross was born in Grosse Pointe, Michigan. She was educated at Harvard College and has taught at Friends Seminary, among other schools. She lives in New York. Wilberforce is her debut novel, and she is currently working on a second book set at St. Stephen's Academy.